'The Eton Rifles' captured both Paul Weller's growing talent as a songwriter and the raw power of his band the Jam, and gave the group their first top 10 hit. 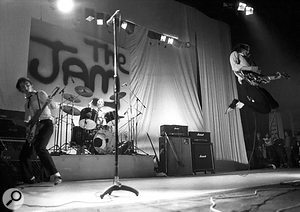 At the vanguard of the 1977 British punk movement, before leading the late-'70s/early-'80s mod revival, the Jam enjoyed massive success in the UK, courtesy of loud, hard-edged, no-nonsense rock that paid homage to the Who, the Beatles and American R&B. The band never attained much Stateside recognition, beyond a sizeable cult following, but in the UK a string of 18 Top 40 singles helped define the socio-musical period in which the band existed. While this was largely due to the uncompromising Britishness of singer, songwriter and guitarist Paul Weller's lyrics, the band that he fronted alongside bassist Bruce Foxton and drummer Rick Buckler did make an indelible impression on the next generation of Brit rockers, as well as on American outfits such as Green Day. After 1977's In the City and This is the Modern World albums established the Jam on the musical map, Weller rapidly expanded his compositional vocabulary, infusing his songs with social commentary, left-wing political observations, British references and home-grown slang, as displayed on 1978's All Mod Cons and the following year's Setting Sons. Originally conceived as a concept album about three childhood friends growing apart, Setting Sons was an acerbic slice-of-life snapshot of young British men during the late '70s. While this often-outstanding record peaked at number four in the UK, and even made a dent on the US charts — reaching a high of 137 in spring, 1980 — the dynamic 'Eton Rifles', taken from it, became the band's first Top 10 British single, hitting number three in November 1979. Photo: RedfernsInspired by a news article that Weller read about unemployed demonstrators on a socialist 'Right to Work' march being heckled by what he later described as "a bunch of tossers" from the prestigious Eton College, 'The Eton Rifles' encapsulated all that was best about the Jam: Foxton's pumping bass, Buckler's powerful drumming, a catchy refrain and Weller's hard-edged vocal delivery of sardonic lyrics — in this case, dealing with class war and opening with the typically colloquial "Sup up your beer and collect your fags, There's a row going on down near Slough." 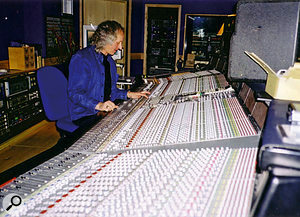 Compared to its predecessors, Setting Sons melded Weller's harmonised guitar parts with more complex arrangements, and this was thanks in large part to the contribution of Vic Coppersmith-Heaven, who was involved in the production and engineering of all the trio's albums, save for 1982's swansong The Gift. "I mixed the Jam's live gigs right up until they got to 10,000 watts at the Rainbow [in North London]," Vic explains. "I used to mix their college gigs, as well as at one of their most popular venues, the Red Cow in Hammersmith, and I also took care of many of their radio and TV mixes around Europe, so I kind of grew up with the band and progressed along with them. We all developed — the musicians developed, the songwriting developed, the technology developed, and we kind of moved with that, introducing harmony guitars and harmony vocals... These things just happened naturally, embellishing the style of the progressive songwriting." Vic Coppersmith-Heaven was given his first guitar and taken to recording sessions at a young age by his father Harry, an orchestral multi-instrumentalist who was a most accomplished alto saxophonist, and who doubled on clarinet, flute and piccolo for the likes of Bert Ambrose during the '30s and '40s and the Goons during the second half of the next decade. "Dad would take me along to the Camden Theatre and my brother Charlie and I would hang out with Peter Sellers, Harry Secombe and Spike Milligan during rehearsing and recording of The Goon Show," Vic recalls. "I think Dad was trying to get me interested in the musical side of things, but I was always more interested and fascinated by what was happening behind the glass in the control room. So, eventually he suggested I might enquire about an engineering apprenticeship, and he soon got me an interview at Decca Studios [in north-west London] as an assistant engineer." Vic Coppersmith-Heaven at the Helios desk in Townhouse's Studio One.Photo: RedfernsVic joined Decca as a tape-op just in time to see an unknown group named the Beatles take a New Year's Day 1962 audition that they ultimately failed. He didn't work on that session, but instead gained his first assignments with opera singer Joan Sutherland, while observing how engineer Arthur Lilley effortlessly captured a 60-piece orchestra and choir. "Arthur became my mentor," Vic recalls. "He introduced me to the idea of becoming an engineer, and he was in fact the person who encouraged this in the middle of a Billy Fury session that Decca A&R man Mike Smith was producing. Arthur must have been in his fifties by then, and his engineering responsibilities were to record classical, opera, jazz and pop sessions, leaving little time for any home life. I, meanwhile, was 16, and all of a sudden, in the middle of the session I was assisting on, he said, 'Right, that's it, I've had enough, I'm going home.' He put his overcoat on, said, 'Vic, you can do this,' and just left me alone to record Billy Fury, an orchestra and the backing singers. "Of course, I was nervous, but I got on with the job, as John Prescott would say. We were recording on four-track in Studio One. Immediately after that I was assigned as engineer to many pop sessions downstairs in Studio Two, which was a mono recording facility with a 15ips BTR2 machine. All the bands of the time who were accepted for audition — mostly from Liverpool, Birmingham and Manchester — would queue up in the hallway, past the canteen and up the stairs into the street, with their drums and guitars and amplifiers by their side, waiting in turn for their audition. It was a far cry from today's process, where CDs or email attachments are sent in as audition material. We'd invite them in, one after the other, to set up and record their rehearsed set, and on the instructions of the A&R department at Decca House they'd each have to record four songs in a couple of hours. As an engineer, that meant you had to be totally on the ball." In 1967, after engineering Cat Stevens' Matthew & Son, Vic began working as an engineer with the artists signed to Don Arden's Contemporary Records label, a subsidiary of Decca, and before long Arden offered Vic a production job with his label. This saw him working with all the label's artists, based from his first production office in London's Carnaby Street, but returning to Decca in his new role as producer for the likes of the Attack and the Nashville Teens. Then, in 1969, he resumed engineering at Olympic Studios, where he was mentored by Keith Grant while working on an eclectic array of eight-track projects that ranged from TV ads and feature films to records by the Rolling Stones, Billy Preston and Joe Cocker. "It was a real turning point for me when I engineered [Preston's] That's the Way God Planned It," Vic recalls. "George Harrison was producing a great line-up that included Klaus Voorman on bass, Ginger Baker on drums, and Eric Clapton and George on guitar. 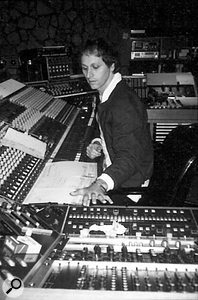 At an early stage of the session, while I was trying to create the sound mix, George came into the control room and said, 'Look, get away from the desk, come into the studio and listen to the song.' That was the first time a producer had ever allowed me to get that musically involved as an engineer. Billy got on the piano and just started jamming the song, and while we had tea and chatted, Eric and George played acoustic guitars and you could really feel the song developing. I then engineered the track pretty much on my own from the control room, while everybody else performed in the studio, until we got the best take. That session was an incredible and creative experience for me." Black Sabbath, Vinegar Joe and Judas Priest were on the freelance agenda after Vic left Olympic in 1971, as were several new acts that he demo'd at the small Polydor facility in Central London about five years later: Generation X, the Clash and the Jam. As confirmed by a gig he saw at the Half Moon pub in Putney, it was the latter's thrashing sound that attracted him most, and the result was his co-production of the trio's 1977 debut, In the City — recorded in 11 days before its mix on 16-track — and production of the hastily-assembled follow-up that same year, This is the Modern World. Still, all of this pales in comparison to what took place after the release of 1978's All Mod Cons. 'The Eton Rifles' went through multiple incarnations, which served as a kind of throwback to Vic's experience tracking the Rolling Stones a decade earlier. "We actually recorded 'Honky Tonk Women' five times," he recalls. 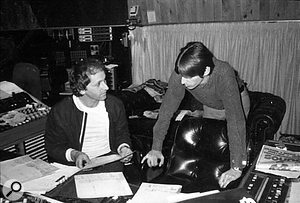 "My fellow engineer Glyn Johns recorded the first version, and then, when he disappeared to the States to work on other projects, we recorded a second and third version of the song. The fourth version, some two months later, was completely live but still not acceptable, the fifth version had live bass and drum tracks with everything else overdubbed, and then it was just left for me to come up with the mix. 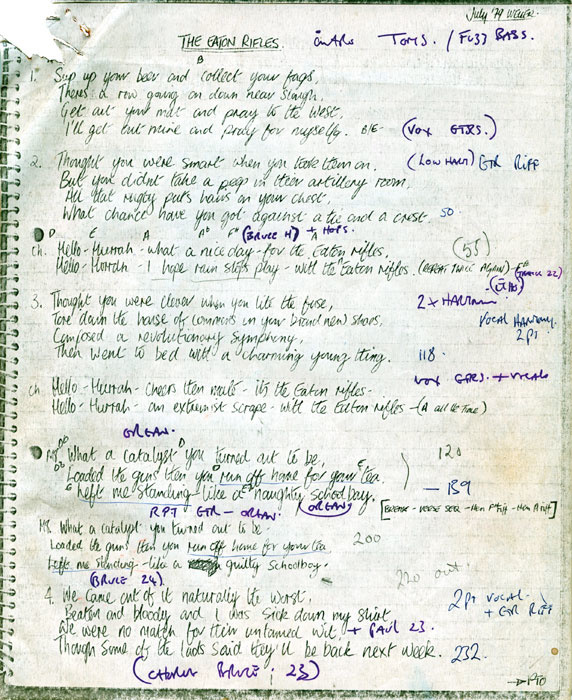 It was almost a three-month process during the recording of the Let It Bleed album, and we followed a similar process with 'Eton Rifles'. We tried it once during the All Mod Cons period and it just didn't work, and then we kept going back to record it. This was at The Townhouse during the time we were finishing off All Mod Cons at RAK. I was working on some other records at the Townhouse and really liked the recording environment there, so I introduced the Jam to that studio. I thought we could achieve a much more exciting sound there. "In all, we recorded 'Eton Rifles' three times. The first time it just didn't have the power, it just didn't have the excitement — either the arrangement or the sound wasn't right, so we left it and worked on some other tracks before coming back to it. I don't recall having that problem with the other songs on the album, and that's probably because 'Eton Rifles' hadn't been played in. A lot of potentially exciting live tracks would suffer from that if they hadn't been exploited onstage, whereas if they had been played onstage for six months or more you'd be able to capture the performance easily in one day. To capture that excitement is purely a question of performance, arrangement and sound all mixing together. "The second version of 'Eton Rifles' was pretty much the same story. There were a lot of exciting tracks on Setting Sons, like 'Burning Sky', 'Thick as Thieves' and 'Private Hell' — they had loads of energy, and in the early stages of recording, 'Eton Rifles' just didn't have that kind of bite. The overall band sound developed during the course of recording Setting Sons — the drums improved, the bass sound would get better, and when that happened we'd often drop a new bass part, for instance, into a track that we'd been working on days before." After In the City captured the band's live set within a studio setting, it fell to Paul Weller to compose new material that would then be arranged in that same environment, and this was the norm by the time of Setting Sons, save for a cover of the Holland-Dozier-Holland classic, 'Heatwave', and a string-embellished reworking of Bruce Foxton's 'Smithers-Jones', which had been the B-side of the 'When You're Young' single just a few months earlier. 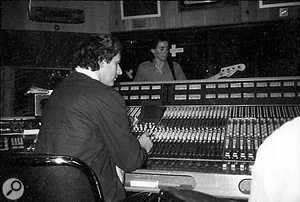 Laying down Bruce Foxton's bass overdubs.Photo: Redferns"Paul was clearly the leading songwriter, and it was his style of songwriting that was most exciting for the band," says Vic. "There were some Bruce songs that [manager and Paul's father] John Weller was trying to convince me to include, but it was less about whose song than it was about the concept of the album. We were all very involved with the production at that stage, and we worked together pretty much as a four-piece in terms of choosing the songs. 'Smithers-Jones' worked because it was fresh, it was new and it was interesting to have a different kind of arrangement, with the strings — for which we transposed rhythms from the original band arrangement to the violin score. It was a very good song. Paul's music virtually conceptualised the Jam at that point. "Polydor wanted Setting Sons released in time for the band's next tour, which had already been fixed. So we were locked into that kind of pattern where Paul had to disappear and write the songs, and then we had to get together to record the album and finish it in time for it to be cut to vinyl, released and promoted — with the videos all shot — before the tour began. I, for one, felt enormously pressurised, but the whole project was also getting very exciting, especially with tracks like 'Eton Rifles' taking off and leaping into the charts." Whereas In the City had been recorded at Polydor, This is the Modern World at Basing Street and All Mod Cons at RAK, the sessions for Setting Sons took place in Studio One at The Townhouse, utilising a 72-input, 32-fader Helios console, Studer 24-track tape machine and Eastlake monitors. "For sound reference I mostly used my own small AR18s as monitors perched on top of the desk," says Vic. "The Eastlakes had TAD tops and mids, as well as Gauss mids, and they were horn-loaded, with Gauss bass drivers. They produced quite a funky sound, and they also had 27-band equalisers on each, which was quite unusual then, with H&H 500 watt amps driving each side. It was a pretty powerful system. The Jam performing 'The Eton Rifles' on Top Of The Pops, November 1979. "Alan Douglas was the engineer for the album, and because I was originally an engineer I'd always — probably annoyingly — jump on the board as well and help with mixes. Alan would have a break and I'd do some mixing, and then he'd come back and take over. We worked well together as a team. All of the songs were initially captured live, and by the fourth album we were into overdubbing every instrument, even the drums. However, we'd always retain the live versions to refer back to, as we were now on 24-track two-inch tape that afforded us more of a luxurious recording process." 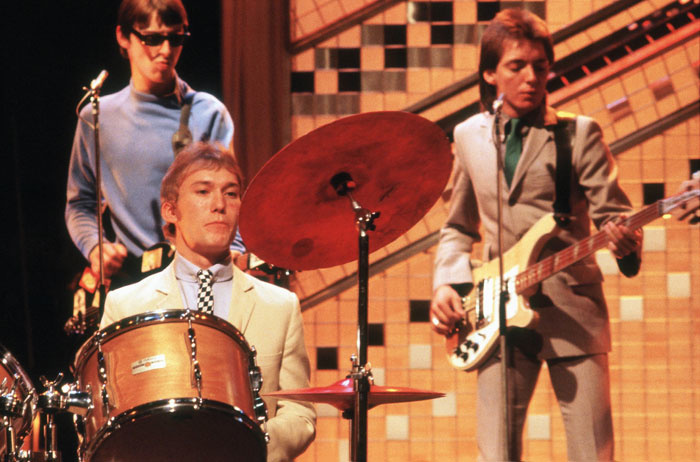 Rick Buckler's kit was set up on a riser at the back of the studio, behind a glass partition that provided an extremely vibrant sound. Looking out from the control room, Paul Weller stood to Vic's left in the main studio, surrounded by corrugated iron for extra grittiness. "The studio didn't quite have the sharp, metallic sound that I wanted for Paul's Vox amp," Vic remarks, "so I went out and bought about 30 corrugated iron sheets and just lined them over the walls and on the floor and in front of the amp, deflecting sound into the microphone. We used a [AKG] D12 with a Neumann U67 — I put the D12 right on top of the Vox amp, smack on the speaker, and then used the 67 to pick up more of the studio acoustics, to help to create a live ambient effect." While playing his guitar, Weller would also perform a guide vocal that would invariably be replaced, just like the DI'd and amplified bass of Bruce Foxton, who was positioned on the other side of the studio to Weller. "We'd either overdub Bruce's bass completely or just slot in certain notes that didn't have quite enough live impact," says Vic. "It was the same with drums and guitar — we might redo the whole guitar part or just touch it up if the sound and performance were 'on'." "The drums usually were miked with a Shure SM58 close to the snare and an AKG 451 to capture the rattle underneath; Shure SM7s and SM57s on the toms; an Electrovoice RE20 on the big tom; and valve Neumann U47s as overheads. 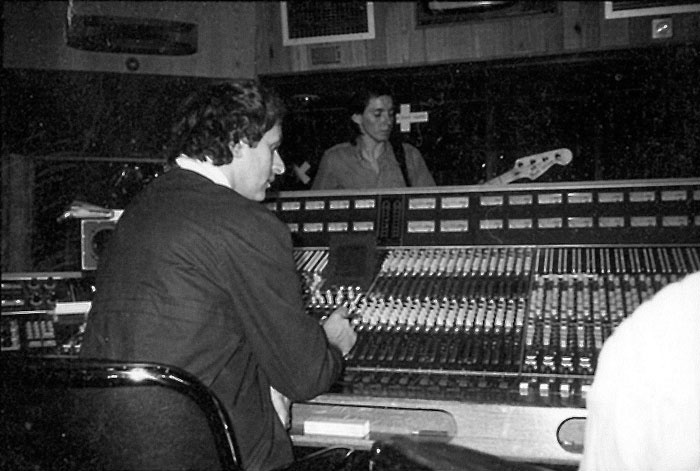 Vic with Paul Weller in the control room at Townhouse.Photo: Redferns"It was a varied approach," Vic says. "I never really had a particular microphone strategy. I would always experiment with different microphones until I got the sound effect I was looking for, and if it didn't sound right I'd just change the microphone. That having been said, we'd mostly use a U67 on the vocal with a pop shield and 14dB pad to capture that aggressive voice cleanly. I was quite a meticulous producer and I'd always be searching for the best performance — when Joe Cocker recorded 'With A Little Help From My Friends' we must have recorded his voice about 150 times. We'd come back again and again — it would be just another night in the studio working on Joe Cocker's voice — and since we were on eight-track, one-inch tape back then, the vocal performance would get erased every time. In fact, I remember starting that backing track with Jimmy Page and friends in Studio Two at Olympic, which was a four-track, half-inch-tape recording facility, and then we copied the four-track master backing track onto eight-track, filled up the other three tracks with backing singers and so on, and had just the one vocal track left for Joe. "So, having previously been involved with the quality of recordings made by Joe Cocker, Mick Jagger and the other artists I'd worked with, I became used to striving for the best. And when the Jam and I got to the Setting Sons sessions, we were all aware that we had to top Mod Cons, which had been a chart-topping album. "There were songs like 'Going Underground' where I never achieved a vocal performance that I was really happy with — I remember going up to Paul in the canteen when I was trying to mix that track after we had completed the recording and explaining to him that the chorus section of the song just didn't quite make it. I couldn't mix it. I don't think he really understood what I was talking about at the time, and he was quite reluctant to re-vocal the chorus section of the track, but he did end up coming back into the studio and really getting into it, which was great. He gave the track the energy it needed. The final vocal performance really carried the song and helped turn it into the hit track it became. "Paul and Bruce used to work really well together for vocal overdubs. I would stand them in the studio with two Neumanns, facing each other about three or four feet apart, so they had eye-to-eye contact, and they'd record their vocals together. And if anything didn't work, we'd drop lines in or replace one vocal or a section of the song on the multitrack. They were often recorded together as a joint vocal just to retain that live excitement, and then we always had the guide performances on spare tracks to refer to in case the energy wasn't right." To fill out the sound, Weller invited some fans into the studio to sing on the 'Eton Rifles' chorus. "There was always a crowd of fans outside the studio, and occasionally he'd sneak them in," says Vic. "I'd be mixing at the desk and I'd feel this unusual presence behind me, and when I'd look round I'd see about 30 kids sitting on the settees. They'd probably been there for an hour while I was intensely mixing. Anyway, in this case he just invited a bunch of them to sing on the chorus. It was a spur-of-the-moment decision, so we ran some lines down from [Townhouse] Studio One into Studio Two, put all the lads — about 15 or 20 of them — in the stone room that was already famous for the ambient Phil Collins drum sound, and recorded them with a [STC 4021] 'ball and biscuit' mic that was hanging from the roof. "It was normally used as a talkback mic for the drummers performing in the stone room — you could punch a button on the desk and it would amplify the sound so you could hear the drummer or vocalist speak. It would override everything else on the desk, and it went through a radio or TV transmitter/compressor that was built into the desk, and that really sucked and blew the sound out, heavily compressing it. It's the sound creation that was used on Phil Collins' 'In the Air Tonight' — the drum sound was treated through that mic — and that's what we used for the 'Eton Rifles' chorus before throwing it back into the mix in Studio One." "One thing that always attracted me to the Jam was their original approach to the music. They'd give quite intense performances, and I'd say the only real difficulty in capturing their performances was that they were a very hard-hitting band — they hit their instruments very hard, more in the early days than later on, and quite often it wasn't easy to get the sound out of Paul's Rickenbacker guitar and Bruce's Rickenbacker bass because hard strikes meant less resonance. There was much more tonal quality coming from the drums — Rick Buckler was original in his approach and very exciting to record. Still, I had to craft the sound as much as I could to achieve the best. Asking musicians to de-intensify or play softer will only make them lose the feeling of what they're doing, whereas sometimes, when you record and record and record, eventually the right kind of energy will emerge, and the correct tone with it." 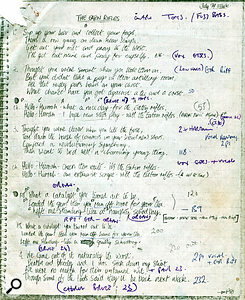 Vic's photocopy of the lyric sheet for 'The Eton Rifles'.Photo: RedfernsIn light of how Coppersmith-Heaven was striving to get a more exciting feel, it seems somewhat ironic that the band members' live performances were nevertheless often replaced with overdubs. "We'd actually moved into a stage of doubling-up Bruce's bass guitar," he says. "He'd do his live performance in the studio, and then he'd come into the control room to drop subsonic notes into the track. That gave it the extra depth that wasn't always achievable with a hard-hitting, one-off performance. At the same time, with Paul getting more into the idea of overdubbing, there were now quite a lot of harmony guitar parts and double-tracked parts adding extra excitement, extra ambience, to the sound. "We brought everything down into Studio Two and did a mix after that final overdub on the third version of 'Eton Rifles', and the track was absolutely burning hot. We just knew it was going to be a great single. It was a 10-minute monitor mix at the end of the session that captured all the atmosphere of the recording, run off onto two-track stereo, and Polydor agreed it was going to be the next single. I was asked to go back and mix it, so I went back into Studio One at the Townhouse and mixed it two or three times, and they were terrible mixes, absolutely awful, with no feeling to them, too much echo — everything was wrong and I just couldn't get it right. "I kept referring back to the original monitor mix that I'd completed at the end of the session and by comparison with my new mixes it sounded really powerful, so one day, while we were finishing things off at RAK, I said to the band, 'Look, I'm going to try something with the original monitor mix. It's a bit silly, but there are bits of vocal missing, there are bits of bass missing, bits of organ missing...' — this was in reference to some organ stabs that Paul had overdubbed — 'and they all need to be lifted out.' I started a process of running the 24-track two-inch tape against the two-track stereo 15ips [on an Ampex ATR100]. I ran the machines together for 10 or 15 seconds each time and then edited back into the mix, lifting segments from the multitrack into the quarter-inch copy of the mix. I spent about a day completing the task, and that was the mix that ended up as the single." The recording of Setting Sons took place from August 15th to October 10th 1979, prior to its November 16th release, and with the record company leaning on both band and producer to come up with the goods in time for the pre-arranged concert tour, the ATR100 mix went right down to the wire. 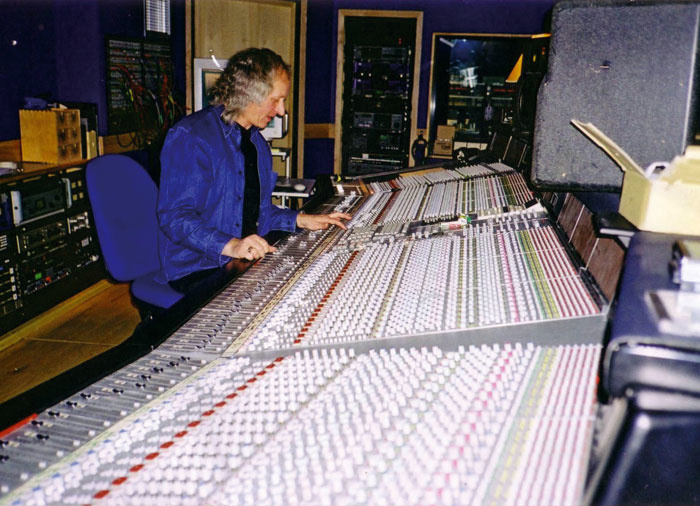 Vic Coppersmith-Heaven at the desk in 2006.Photo: Redferns"When we finished that album, the last mix was completed at about seven in the morning," recalls Vic. "We were just working full throttle towards the end of the project. The band would come in and check the mixes, suggest changes if they didn't like certain things, and they got involved in the whole process with me. "We finished the record early Tuesday morning, Polydor wanted it in the factory by the Wednesday and I booked a session to cut the album to vinyl master at nine o'clock Tuesday morning at the Townhouse. Well, at about 7.30am I just curled up on the sofa exhausted and fell asleep, and it was only because I was woken up by the cleaner using the Hoover at nine o'clock that I made it in time! I remember throwing my head in the sink and having a quick wash before going to the cutting room and spending the whole day with Ian Cooper, who was the head cutting engineer back then. I was tweaking the sound with him — the levels, the dynamics and the equalisation — to produce the final cut, but my ears were pretty shot by that time, having worked for several weeks on the recording and mixing, and when the pressing came back from the factory it sounded absolutely terrible. "We'd ruined the overall sound by over-tweaking it. It was too thin. So, I then had to give Polydor the bad news that I had to reject it. The record company people made it clear they were not happy with me, and when my next royalty statement arrived they'd deducted the cost, which came to about £2000 in studio charges. That really upset me, because it wasn't something that I was personally responsible for. However, I was more into creating music than arguing with huge corporations, so I swallowed it and carried on. I was allowed to re-cut the album and without question it benefited from the re-working of the sound to vinyl, so in that sense I was happy. At least the record has sustained itself for nearly 30 years, and if I wasted a few thousand pounds of Polydor's money, as they claimed at the time, they've probably made it back a million times over since then."